Readers will recall the strange case of “Dumb Starbucks” earlier this year, which initially seemed to pose the question of whether a coffee shop that transparently used the marks and copyrights of Starbucks could claim fair use as an art gallery. It turned out that the entire performance was just that, a lead up to a Comedy Central series that has since debuted. We are not, of course, television critics, but in addition to being hillarious (and undoubtedly tongue in cheek), the full episode is an interesting platform for questions about the players and entities that can claim fair use to copyrights or trademarks over visual and creative works. In the end, the parody/fair use question could never really be answered, but the coverage the numerous news clips that the show included is a reminder of the difficulty of applying art critical concepts to legal analysis. As we suspected, the "Dumb Starbucks" store in Los Angeles claiming a right to copy Starbucks's logo and store design by relying on fair use turned out to be a prank after all (bolstered, as I did not realize yesterday by the fact that despite what the store said about selling coffee, they were actually just giving it away). It turns out that Nathan Fielder of Comedy Central was behind the whole thing, for use on his show "Nathan for You." Less funny for him was that yesterday the Los Angeles Board of Health closed the store for distributing food products without the proper licence. 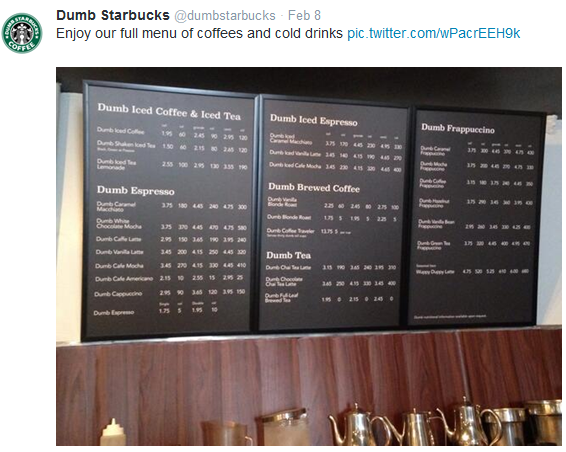 Is "Dumb Starbucks" an Art Gallery in the Eyes of the Law? News that a coffee shop had opened in Los Angeles entitled "Dumb Starbucks" has again raised the proper interpretation of fair use under U.S. intellectual property law into the realm of popular culture and commerce. Whereas last year’s Beastie Boys/GoldieBlox dustup (still ongoing) revolved primarily around copyright law, here the potential issue is one of trademark infringement. To stave off accusations of liability, the new enterprise has preemptively labeled itself an "art gallery." Will this hold up? Even Starbucks seems puzzled.